My blog will be called The Wonderful World of Antiques Blog! How Exciting! This is my first blog ever. I will pick one rare antique item or subject each month, which The Wonderful World of Antiques Blog by Elegant Findings Antiques will feature. By featuring a new antique piece or subject each month, you can learn more about rare antiques. Some of the antique piece(s) I feature will also be for sale to you. Remember, like all antiques, it will be one of a kind. Therefore, if you love it, let me know quickly before it sells to someone else. I would also like to write blogs on many subjects that will be informative to you, and will teach you about subjects that you would like to learn more about. We will be blogging on many subjects including antique porcelain, crystal stemware, decorative accessories, paintings and any other rare antiques or antique subjects that have inspired me. More Fabulous News- Elegant Findings Antiques has a brand new Mobile Friendly website called elegantfindingsantiques.com for your convenience. This is the website that our blog The Wonderful World of Antiques Blog can be found. I have been working for two months to make our new mobile friendly website. We really hope you will enjoy it. 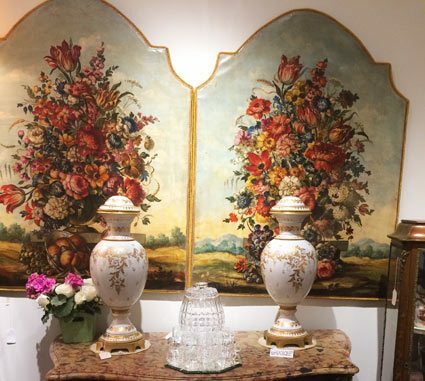 Please browse our multiple pages of rare antiques including antique European china, crystal stemware, decorative accessories, furniture and rare antiques. It is finally finished. Hurrah!!! Come back and visit The Wonderful World of Antiques each month for our monthly featured antique subject. We look forward to teaching you many things from the knowledge which I have learned from being in the antique business for thirty years. I hope with the information from my blogs, the antique world becomes a wonderful world to you.